There are a number of things I started doing (or avoiding) once I realised that I was constantly reaching beyond my limits and actually causing my flare-ups, I will share them here. I hope you will find these tips useful and relevant. Here’s my list, please feel free to add any coping methods you have found helpful in the comments below. Schedule regular rests throughout the day. Make time for one thing each day that you enjoy. Avoid stressful environments and negative people. Ask for and accept help, delegate. Use mobility aids and equipment. Find an online community to join. It is vital that you do not over exert when you have ME/CFS. Over exertion can trigger a bad flare-up or relapse which could last months. I’ve been there and it’s not fun! The concept of listening to your body is simple, if you are experiencing any increase in symptoms after exertion, whether its simply brushing your teeth or something more taxing like doing your weekly grocery shop, then you need to cut back on that activity or plan complete rest before and after the activity so your body can recover quickly. Do not push through it, you will only cause yourself more harm. Listen to your body. Typically, ME/CFS affects high achievers or “Type A” personalities. It is very hard for us to slow down, lower the bar and leave things undone, but it is vital to accept early on that doing less is best. Not all chores are a necessity. You don’t have to finish everything. You are allowed to rest and take care of you. The focus needs to be on absolute necessities and everything else can be scheduled on different days and rotated. Your natural way of thinking, your need to crush all targets, finish everything and make everybody else happy will cause you more pain and weaken you more. It is counter-productive. Short-list, prioritise, it’s okay to say no. 3 Schedule regular rests throughout the day. This goes hand in hand with the previous point. Rest needs to be one of your priorities each day. Regular rest periods should be scheduled in and taken as seriously as your morning bathroom routine. Without scheduled rest, you will inevitably end up doing things for extended periods of time, often not realising how much you’re exhausting your body (mentally or physically) and this will lead to increased symptoms later (PEM – Post Exertional Malaise). Rest frequently for better productivity. 4 Make time for fun! As most of us tend to be people pleasers, we will often forget to take care of ourselves. You might be running after your children, doing chores, going to work and trying to keep everybody else happy. Even if you’re housebound or bedridden, you might be answering emails, accepting visitors, trying to keep your house clean or showering daily because it’s what you feel needs to be done. As good as all these activities are, they can be detrimental to your physical and mental health if you’re not making time to do things that you enjoy too. If you’re running after obligations, giving in to guilt, trying not to offend anybody or let anybody down, you could be heading for a big crash. You need to schedule some “me time” daily. What you end up doing is never having any down time, no time to just enjoy life, to unwind, to just be. This kind of disconnection will play havoc on your emotional well-being, so make sure to schedule something that makes you smile, calms you, refreshes you – make time for you. 5 Avoid stressful environments and negative people. Stress is a huge trigger for people with Chronic Fatigue Syndrome. It can even have worse effects than physical exertion in some cases. Make sure to remove yourself from any stressful circumstances and stop communicating with those who bring you down or stress you. Such relationships will only make your condition worse and keep you from improving. Your focus now needs to be on recovery, and negativity hinders recovery. Keep in mind that online communication, like commenting and chats, can be just as stressful. Avoid the comment section if there is debate and argumentation going on. Purge all conflict – seek joy and encouragement instead. People with Chronic Fatigue Syndrome usually suffer from sensory sensitivity, so it is vital to minimise the effects of your environment. Some things that will affect the severity of your symptoms, specifically pain and cognitive function are: noise, crowds, bright lights, movement, strong smells. Try to avoid these as much as possible. At the very least you should make time daily, preferably a few times throughout the day, to escape to a quiet, darkened room for a few minutes to just recharge and give your senses a rest. It really does help! 7 Ask for and accept help, delegate. For most high achievers it is very hard to ask for help or accept it when offered. We like to do things ourselves and do our best in everything. The problem is that with ME/CFS, you would be doing more harm than good is you tried to do everything yourself. You need help. If you live with family in the house, it’s time to teach the children how to sort the laundry and do the washing up. Your other half should already be helping you out and if not, it is vital that you stress the damage that will occur if you keep pushing. Delegate, but be kind and don’t hold everybody else to the same high standard you hold yourself. Be okay with some things being left and other things being half done. Don’t stress over the small things. As long as everybody is fed and cleaned, the rest is just icing on the cake. The important thing to remember is that bathing is an extremely high exertion activity which sometimes includes washing hair and shaving as well as getting undressed, dried and dressed again! It’s a huge workout for somebody with ME/CFS! If you’re feeling constantly exhausted and weak, stuck in bed all day and not sure why, but you’re still showering or bathing daily, then I’m almost certain that’s your answer! It’s time to cut back and make room for other activities. Cut back on showers so you can enjoy a better quality of life! 9 Use mobility aids and equipment. You might feel embarrassed or fearful the first time you use a wheelchair or walking frame, but the freedom it allows you and the effect it has on your symptoms and independence is worth it and those initial negative emotions soon vanish! You will be able to enjoy the occasional days out so much more with diminished payback, if you use mobility aids to minimise exertion while out. Your body will have enough sensory and emotional input to deal with, by minimising the physical activity, you can limit the severity of your inevitable PEM. 10 Find an online community to join. 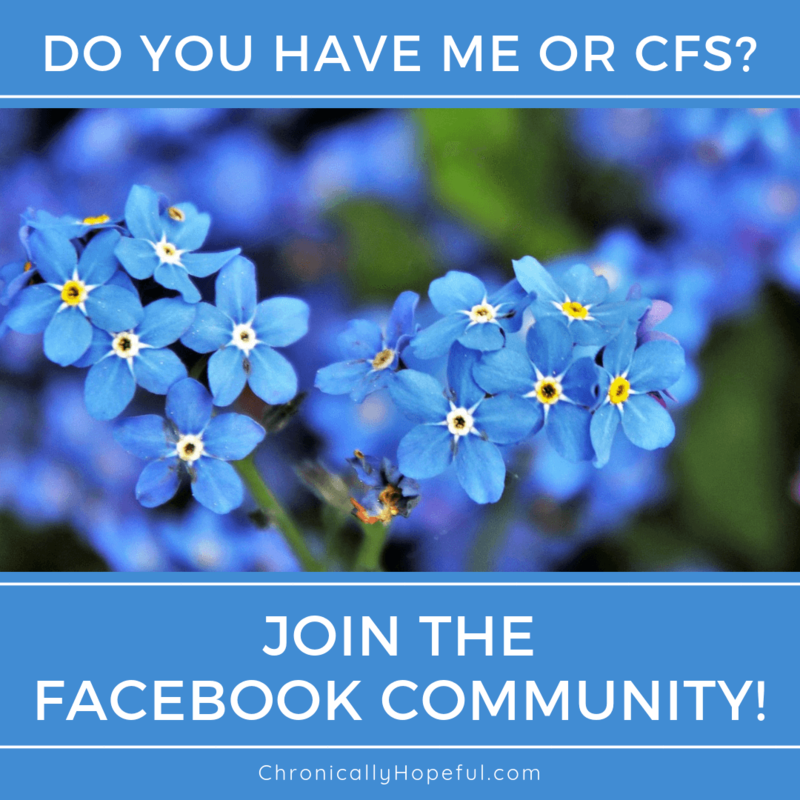 Online communities are really helpful in helping spoonies come to terms with a new diagnosis. Not only do you find other people who know and understand exactly what you’re going through, but also the wealth of invaluable information, advice and experience that only other spoonies will have. These groups are where you find “expert patients”. People who can give you the most accurate advice when it comes to ME/CFS because this condition is so widely misunderstood in the medical field that doctors are often left frustrated and unable to help patients at all apart from prescribing pain killers. The practical advice on managing life with ME comes only from patients who have lived it. Be careful not to linger in groups where the focus is on rants and moaning about symptoms without any positive advice and feedback from more experienced patients. There are some wonderfully positive groups out there, but they are few and far between. Yes, you feel awful and want to let off steam, but a beneficial group is a group that helps, advises, encourages and supports each other. Not a group that helps you dwell in the pain and pity without offering any positive options and where patients don’t seem to take any steps to help themselves. Such negativity needs to be purged as mentioned previously. People with ME/CFS cannot afford to sit back and wait or just continue with life as before, we must find support and put plans into action to manage our new normal to the best of our ability while keeping within our limited supplies of energy and strength. Unfortunately your GP will not be much help in this area, you need to take initiative. You must listen to your body, don’t push through payback, schedule time for rest and fun – daily, eliminate any negativity and focus on things that bring you joy and peace. It’s okay to say no to invitations or requests and it’s okay to skip a shower or a chore if it means you get to have more energy and strength to live a better quality of life. Delegate and ask for help from friends and family. You’ll be surprised to find help comes from most unexpected places sometimes. This is your time to rest. Your full time job needs to be recovering to a good standard of life. It will take time and the journey isn’t linear. You will crash, flare and relapse along the way, but there are plenty of ways to make each day enjoyable despite the pain and believe me, it will get better again! Most importantly, be kind and patient with yourself. I have created a new online community as I felt like forums were constant moans and depressing places. I am hoping in the next few weeks to be putting more audio files so people can click and listen if they don’t feel well enough to be reading info on pages all the time. Hi Louise, Thank you for letting us know about the CFS Buddy Club. It looks great!